There are many celebrities supporting Bernie Sanders (along with celebrities supporting other candidates). Celebrities might not be experts on public policy, and their recommendations as to who to vote for might not mean very much, but comments from them often result in a tremendous amount of publicity. Susan Sarandon’s comments that Donald Trump might be better than Hillary Clinton would not mean very much if not for the fact that this highlights a problem Clinton will have in the general election. Many on the left will never vote for Hillary Clinton, for a variety of reasons. Some actually prefer Trump over Clinton. These are primarily those who stress trade deals, finding Trump preferable here. Plus Trump has been less hawkish than Clinton in supporting military intervention and nation building (not that I’d trust him at all on foreign policy). Others see Clinton as being more likely to move the country to the right than Trump or a Republican. Policies from Trump would be opposed by Democrats, often being enough to block them from being passed. Clinton has already indicated a willingness to compromise with Republicans on areas from Social Security to access to abortion. We have already seen the downside of compromise with Republicans and triangulation by Bill Clinton. Such compromises by Clinton with Republicans would be more likely to move the country to the right than policies from a Republican president who would not have bipartisan support. We would be more likely to see cuts in Social Security, and restrictions on access to abortion, if Clinton is elected compared to Trump or another Republicans. There is the question of what happens in 2018 and 2020. There is the fear that the election of Clinton would be highly damaging to the Democratic brand, leading to bigger GOP pick ups in 2018, and further state governments falling under Republican control in 2020, leading to more Congressional districts being redrawn to help Republicans. Plus there is the effect on the Democratic Party. At what point is supporting the lesser of two evils counterproductive? Will Democrats continue to move to the right if they find that there is no political cost? If Clinton wins in 2016 she will probably be the nominee in 2020, leaving us stuck with eight years of a conservative Democrat. Or there is the danger that she lose in 2000, leaving a damaged Democratic brand, leading to a longer stretch of Republican presidents, and even more Republican court appointees. Some prefer a loss in 2016, feeling that there is a better chance of having a liberal Democrat in 2020. A Clinton loss might be the final straw to kill off the remains of the DLC. Plus another candidate as opposed to Clinton might increase the chances of Democratic pick ups in state governments, as opposed to having a party led by Clinton running for reelection in 2020. The Nader/Gore argument from 2000 does not have much traction with many who do not plan to vote for Clinton because Clinton has many of the same problems which led the left to be so strongly opposed to Bush. Clinton supports the same neoconservative foreign policy. She has a conservative record on civil liberties, falling to the right of Antonin Scalia and even sounding far too much like Donald Trump on suppression of freedom of speech. Her opposition to open-government and government transparency is even worse than what we saw under Bush. She certainly is the last candidate to consider when looking at the role of money in government. If the election of George W. Bush was such a terrible thing in 2000, then voting for a candidate who supports so many of the same policies hardly seems acceptable. The bottom line is that you may agree or disagree with the arguments above but the thing about democracy is that everyone makes their own decision. You can argue all you want, but you cannot make anyone vote for Clinton, even if she is the lesser of two evils. Some will ultimately vote for her, while others will either not show up to vote for a candidate they disagree with, or will vote for another choice. The polls have been quite clear that there is a significant drop-off in Democratic votes in general election match-ups when Clinton, as compared to Sanders, is the candidate. We already saw what happens to Democratic turnout in 2014 when Democrats run as Republican-lite. It doesn’t matter if they are wrong and you are right. 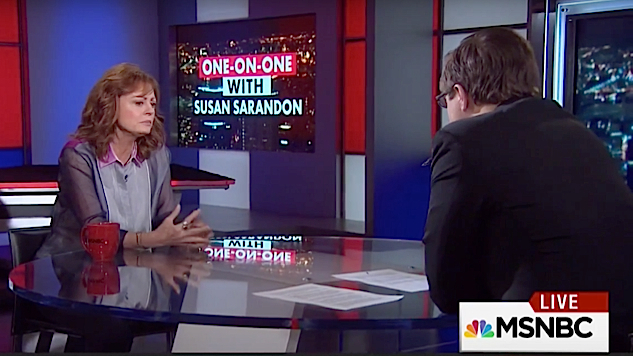 It doesn’t matter if Susan Sarandon is insane. If Democrats nominate a candidate as flawed as Hillary Clinton, many people will not turn out to vote for her, no matter how logical your arguments are that they should. Susan Sarandon has just highlighted a point which has already been clear. If you are worried that many liberal and progressive Democrats will stay home or vote third party if Clinton is the nominee, letting Donald Trump become president, you are right. This could happen. Many people will not be able to vote for a corrupt warmonger like Clinton, so to ensure that Donald Trump does not get elected, the safest course would be to nominate Bernie Sanders to be the Democratic candidate. It is the obvious solution as he would not only make the better president, but he would also be the stronger general election candidate.